"'On evenings I'm busy helping our two kids with homework and don't have time to spend in the kitchen, I rely on this easy recipe,' relates Debbi Mullins of Canoga Park, California. Italian dressing gives fast flavor to the juicy chicken and tender potatoes in this satisfying supper." Place chicken in a greased 13-in. x 9-in. x 2-in. baking dish. Arrange potatoes around chicken. Drizzle with dressing; sprinkle with Italian seasoning and Parmesan cheese. Cover and bake at 400 degrees F for 20 minutes. 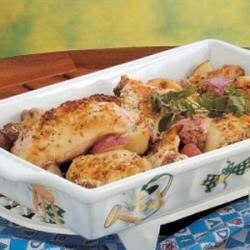 Uncover; bake 20-30 minutes longer or until potatoes are tender and chicken juices run clear. Make sure to pre-boil your potatoes! I ended up taking the chicken out to microwave my potatoes. It is an easy meal to make, taste was okay. My (picky) family ate this one up and asked for an encore appearance. Cook time is a little longer than advertised.